Departing from Air Travel on January 16, 2020, prices starting at $14,680. The world’s ultimate state-of-the-art expedition ship, the National Geographic Explorer is a fully stabilized, ice-class vessel, with an Ice-1A Super on the forward hull, enabling it to navigate polar passages while providing exceptional comfort. It carries kayaks and a fleet of Zodiacs, plus a remotely operated underwater vehicle (ROV) and sophisticated video equipment, extending access to the underwater world. 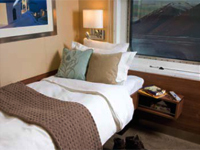 Her design and equipment is the result of almost 200 years of collective expedition experience and combines the privilege of wildness and the luxury of comfort accommodating 148 guests in 81 cabins, including 13 with private balconies, six spacious suites and even cabins specifically designed for solo travelers. She is spacious and modern, with a variety of public rooms that offer startling views of the passing landscape. 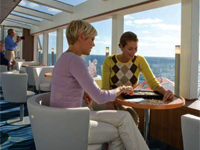 Friendly and informal, Explorer instantly fosters a welcoming environment where enthused and curious passengers share in exceptional experiences and enrichment. 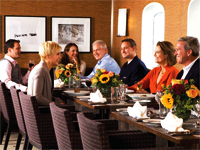 The multi-windowed main Dining Room is a casual and relaxing place. 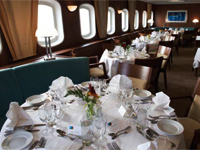 There's no assigned seating to allow for free mingling - and configurations from tables for two to banquettes and a Captain's Table that seats twelve. Breakfast and lunch are buffet-style, while dinner is served. Choose to dine in the Bistro Bar whenever you prefer, or drop by for a cappucino or a latté, or a drink in the evening - especially when a gifted player is seated at the piano. 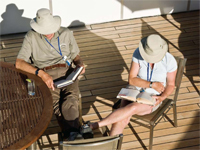 Explorer's bow and deck spaces are perfect for stretching your legs; shooting photos; gathering with onboard experts to observe and learn; and experiencing the unparalleled freshness and immediacy of life at sea. 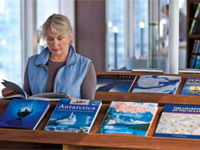 The well-stocked library, furnished with inviting leather reading chairs and brimming with definitive guides, books, novels and gorgeously illustrated coffee table books, offers a warm and relaxing environment for reading and scanning the horizon. The Lounge is the heart of the expedition community. It's where guests and expert staff convene daily for Recap - entertaining and informative presentations, cocktails, hors d'oeuvres. The Lounge is also a great place to hunker down with a book, open your laptop, or catch the "golden hour" in midnight sun geographies. The Mud Room enables safe, simple loading and unloading of Zodiacs, allowing more exploration time. It also contains assigned lockers for conveniently stowing life vests, outdoor clothing and gear. 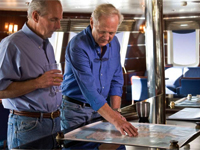 The Chart Room, decorated in hues of warm mahogany and cool chromes, is a magnet for the navigation-enthused. 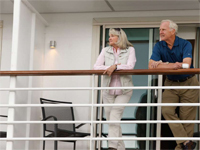 It boasts nautical maps and hot beverage station offering coffee, tea and hot cocoa. Visit the LEXspa for relaxing massages and body treatments. Includes sauna, shower, towels and robes, two Wellness specialists, and two treatment rooms. 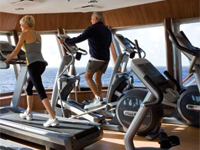 The onboard fitness center is equipped with freeweights, stretch bands, balance balls, treadmills, elliptical and stationary bikes. 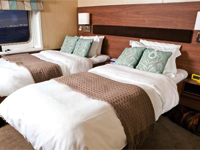 Stateroom Images are representative of staterooms in that category and type. 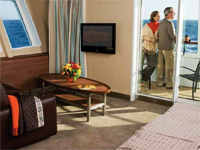 Some rooms in the same category may have different furniture configurations, facilities and/or window/view configuration. Room measurements are approximate. Please see deck plans for specific information.